(Phys.org) —Astronomers using the NASA/ESA Hubble Space Telescope have, for the first time, determined the true colour of a planet orbiting another star. 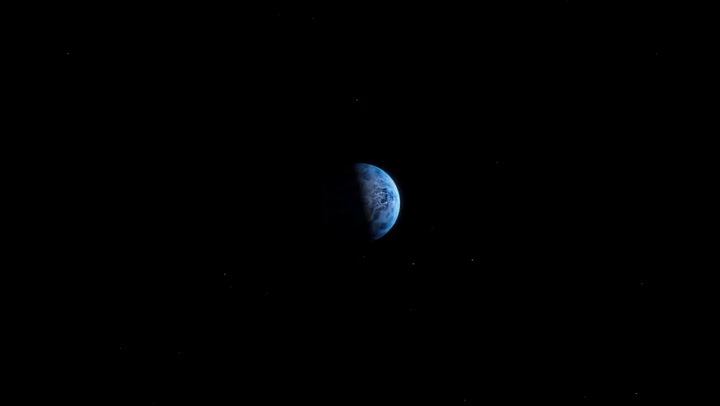 If seen up close this planet, known as HD 189733b, would be a deep azure blue, reminiscent of Earth's colour as seen from space. At a distance of 63 light-years from us, this turbulent alien world is one of the nearest exoplanets to Earth that can be seen crossing the face of its star. It has been intensively studied by Hubble and other telescopes, and its atmosphere has been found to be dramatically changeable and exotic, with hazes and violent flares. Now, this planet is the subject of an important first: the first measurement of an exoplanet's visible colour. "This planet has been studied well in the past, both by ourselves and other teams," says Frédéric Pont of the University of Exeter, UK, leader of the Hubble observing programme and an author of this new paper. "But measuring its colour is a real first—we can actually imagine what this planet would look like if we were able to look at it directly." In order to measure what this planet would look like to our eyes, the astronomers measured how much light was reflected off the surface of HD 189733b—a property known as albedo. HD 189733b is faint and close to its star. To isolate the planet's light from this starlight, the team used Hubble's Space Telescope Imaging Spectrograph (STIS) to peer at the system before, during, and after the planet passed behind its host star as it orbited. 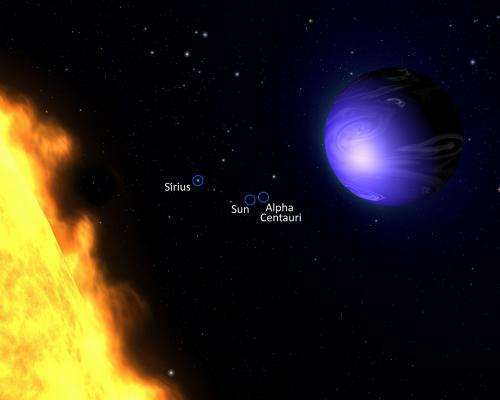 As it slipped behind its star, the light reflected from the planet was temporarily blocked from view, and the amount of light observed from the system dropped. But this technique also shows how the light changes in other ways—for example, its colour. The planet's azure blue colour does not come from the reflection of a tropical ocean, but is due to a hazy, turbulent atmosphere thought to be laced with silicate particles, which scatter blue light. Earlier observations using different methods have reported evidence for scattering of blue light on the planet, but these most recent Hubble observations give robust confirming evidence, say the researchers. HD 189733b presented a favourable case for these kinds of measurements as it belongs to a class of planets known as "hot Jupiters". These massive planets are similar in size to the gas giants in the Solar System, but instead lie very close to their parent star—this size and proximity to their star make them perfect subjects for exoplanet hunting. We know that hot Jupiters are numerous throughout the Universe. As we do not have one close to home in our own Solar System, studies of planets like HD 189733b are important to help us understand these dramatic objects. "It's difficult to know exactly what causes the colour of a planet's atmosphere, even for planets in the Solar System," says Pont. "But these new observations add another piece to the puzzle over the nature and atmosphere of HD 189733b. We are slowly painting a more complete picture of this exotic planet." That's incredible! The more I read about this planet, the more I wish I had a telescope powerful enough to actually see it myself. Even if the planet reflects blue light, wouldn't it simply glow red or yellow because it's just that damn hot? So to the naked eye it could look like anything. If the planet glowed red then the red component would be seen to drop when the planet was eclipsed. That fact is that it would look deep blue, whether we understand why or not. The melting point of silicon is just over 1400 C. That's why they are theorizing it would rain silicon there. With average temp around 1000 the temp range from the equator to the poles probably straddles the melting point of silicon. The more we learn about planets, the stranger they get. 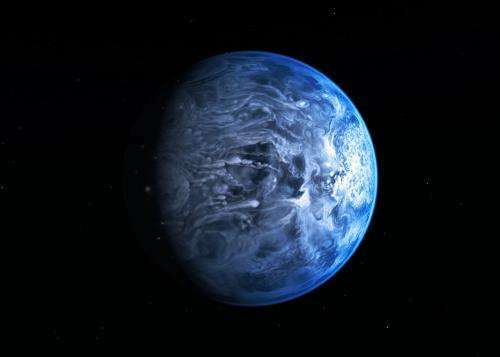 From the description, it sounds like the planet looks something like the color of silicon photovoltaic cells, which are made of silicon crystals, and have a deep purple-blue color. Of course, there's not really any way to test the method used here and verify that it works as intended. You need a second independent method to see if you come up with the same thing. They may significantly refine this result with further analysis. Still a cool thing to think about though. 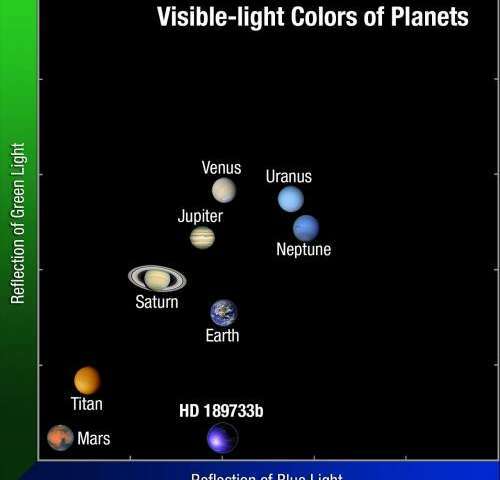 If the planet reflects blue light from the star, and it emits black body radiation at 1700 K which is roughly the color of candlelight which is yellow, it should actually appear white. Black body emission requires an emissivity which is independent of wavelength and that is patently not applicable. What we know is that it actually appears blue, the measurement tells us that directly. What we don't know is why.